It gets harder and harder for me to feel sorry for myself, when I see the progress we’re making on our home. Granted, we don’t have flood insurance, so we’re paying for all the repairs and replacements out of pocket, but maybe we’ll be approved for a low interest loan from FEMA. Sure, we have to do a lot of the work ourselves, but we’re learning a lot. And when I look back over the pictures of our house, as compared to many of the homes I’ve seen, it puts our damage into perspective. Of course, I pass some homes that sustained little to no damage, and wonder why that couldn’t be us. Ah well. I’m sending some pictures along, attachments to a few emails. I finally managed to download them off of my camera. There is much I haven’t taken pictures of, but I’ve included a few that will give you an idea of what our lives look like. I’ll include a brief description of each picture. Please excuse my poor attempts at humor. 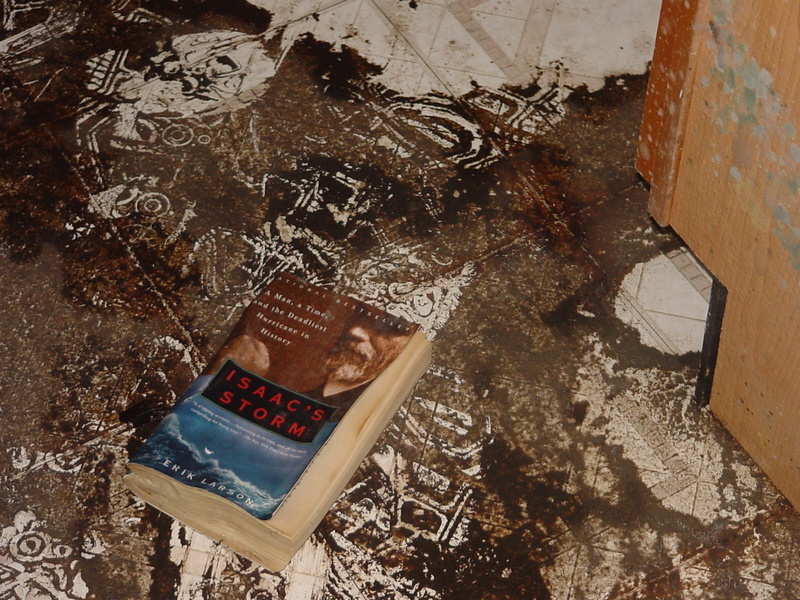 Katrina 1 – Isaac’s Storm is one of the books I was reading as I prepared to write our CAT V (Five) story. The book tells of the 1900 storm that hit Galveston, killing over 6000 people in the storm surge. Ironically, it was at my bedside and was ruined in the flood waters. 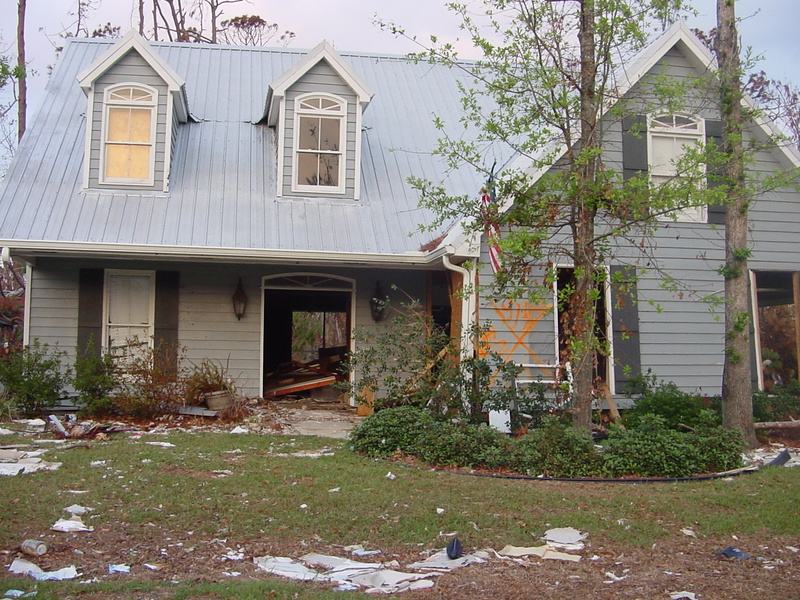 Katrina 2 – A picture of our house when Jon arrived home on his reconnaissance trip. 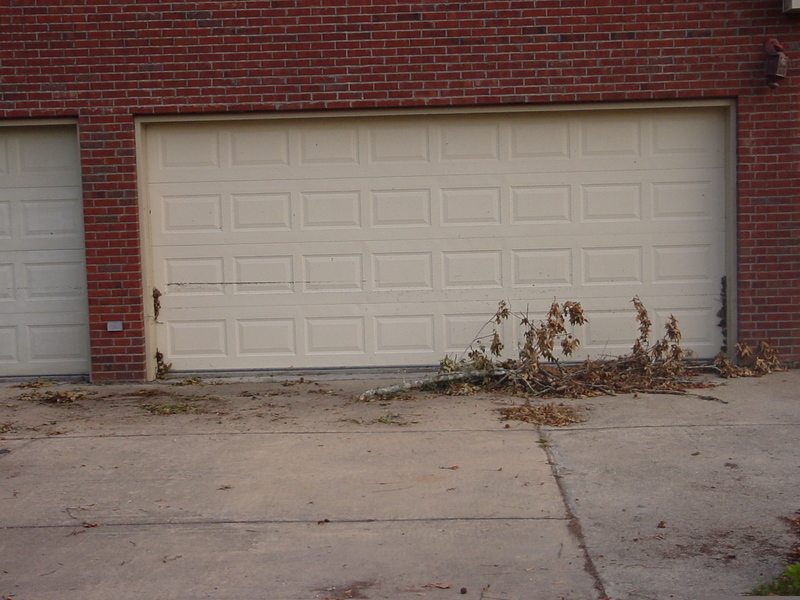 It looks pretty good from the outside, until you see the water line on our garage door. 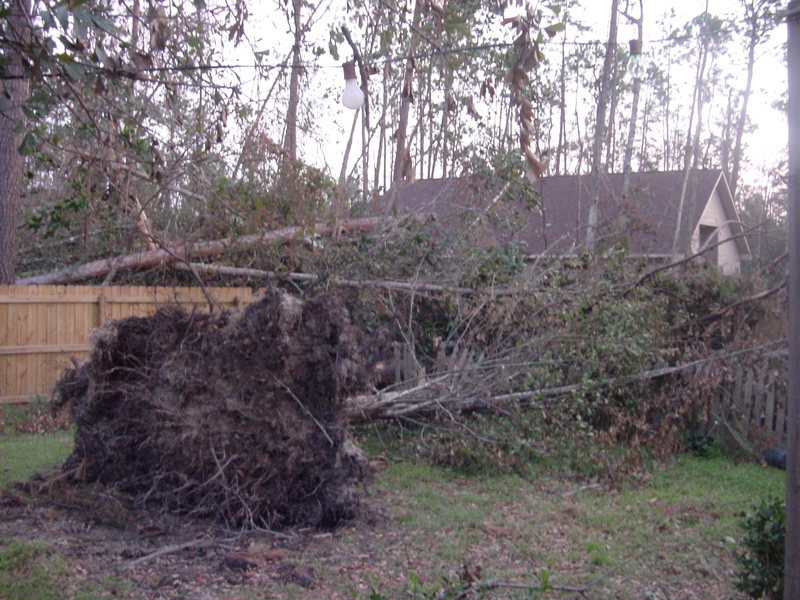 Katrina 3 – One of the three trees in our yard that blew over. Three other trees fell into our yard and two trees were leaning precariously and needed to be removed. 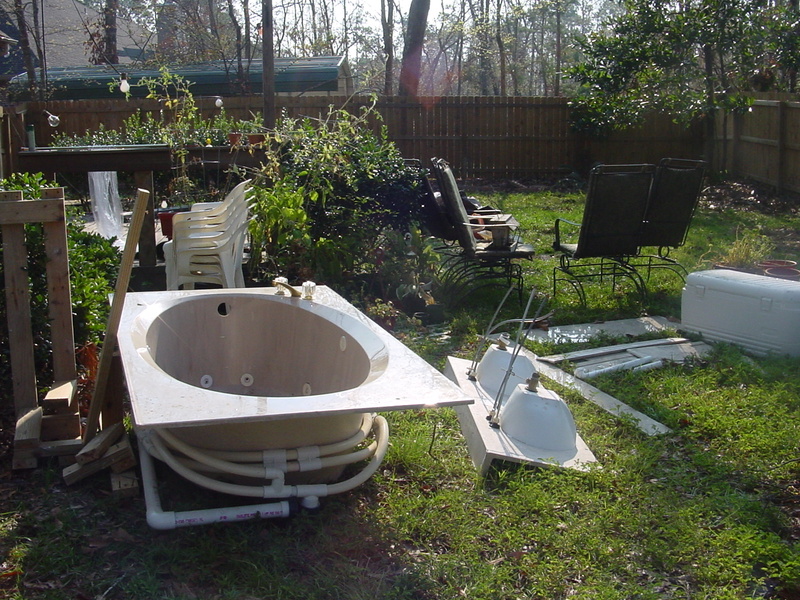 Katrina 4 – Our redneck hot tub in the back yard. Actually, Jon and a crew of men had to remove our garden tub from our bathroom, to get to the wet sheet rock and insulation behind it. Katrina 5 – The front of our house as it looks today. We’re still waiting for FEMA refuse removal to come down our street. Debris in the front yard is in vogue on the coast this year. Katrina 6 – A view of the woods down one of our streets. It seems that literally every other tree in Diamondhead is either snapped or blown over. If a tree still stands, its limbs were ravaged by the wind and water. 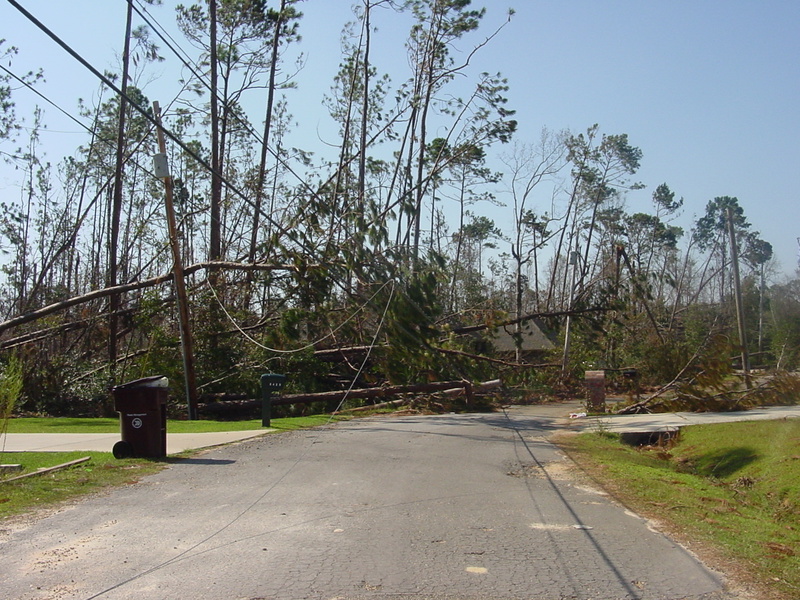 Katrina 7 – Another view down one of our streets. 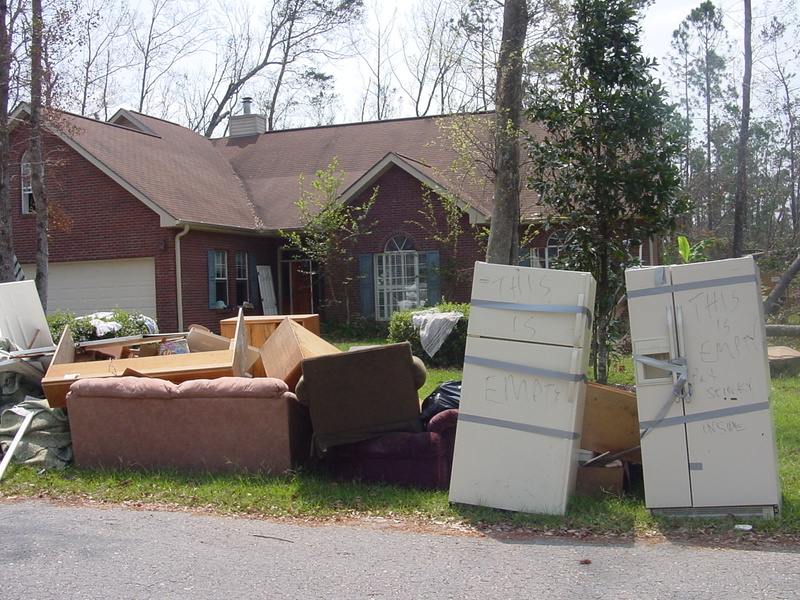 Everyone who was flooded had to put their ruined furniture, belongings, sheetrock and insulation somewhere. It makes driving around the neighborhood quite a challenge, because the debris starts spilling over into the streets. Katrina 8 – Another picture of our neighborhood. It would make an interesting reality show: Dodge the Debris. 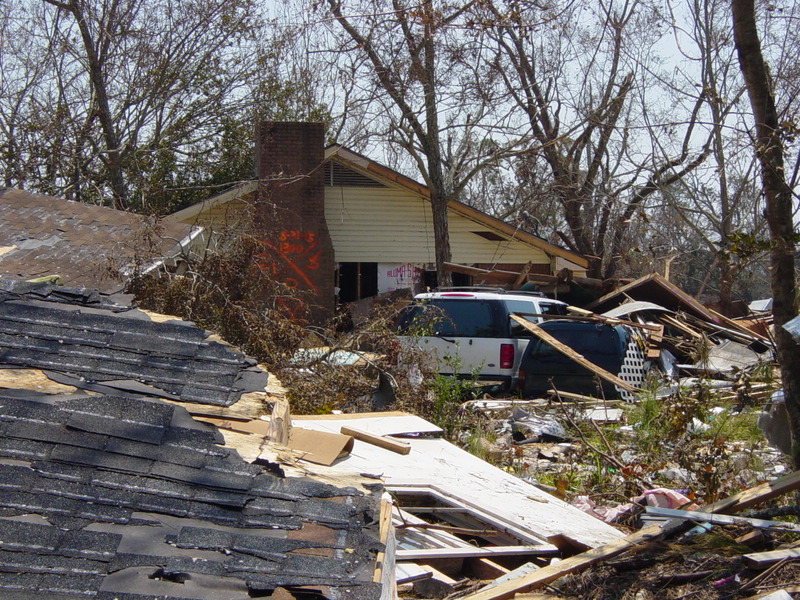 Katrina 9 – One of the washed out houses in Diamondhead. The angry thirty foot storm surge roared through the neighborhood, ripping out everything inside. 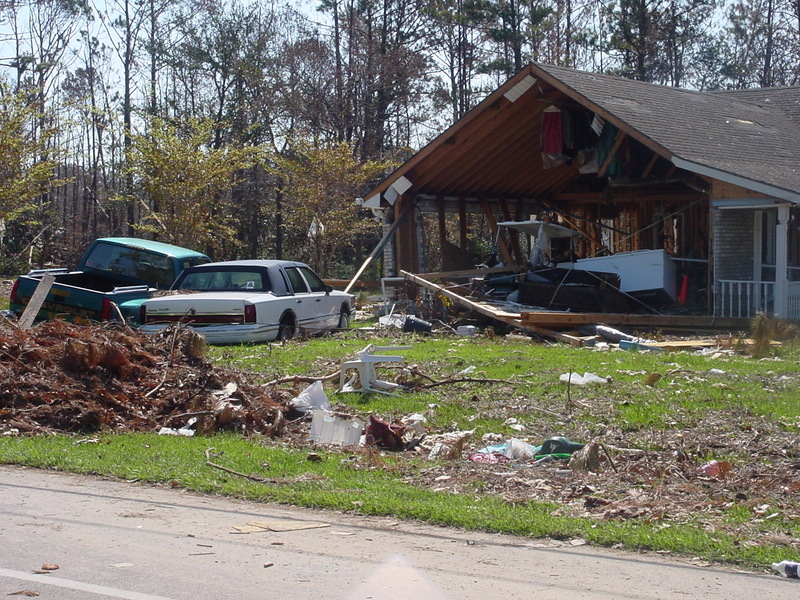 Katrina 10 – Another washed out house in Diamondhead. 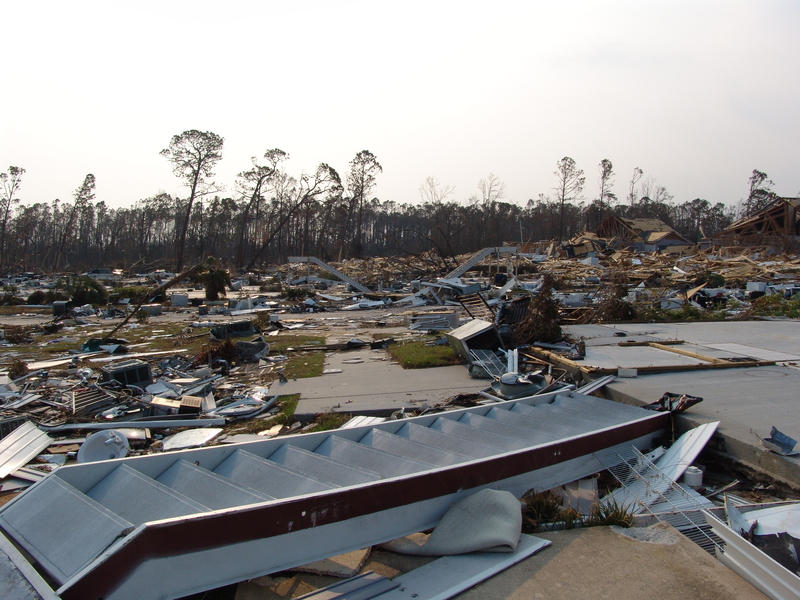 Katrina 11 – Jon and I took a very heartbreaking drive down to Bay St Louis. The big oak has a sign that reads “Tranquil Oaks”. Behind it is the remaining foundation of what used to be the home. 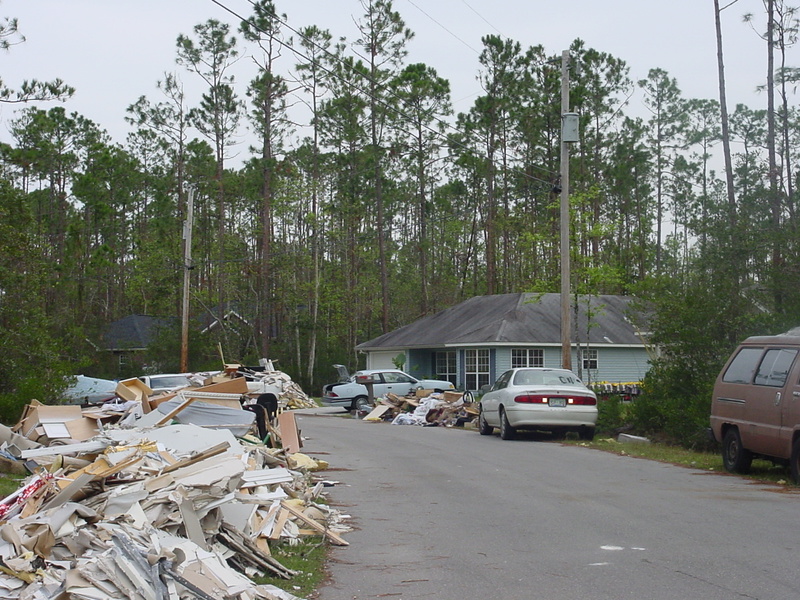 Katrina 12 – A home in Bay St Louis that was completely washed out, with the roof remaining on top of the foundation. 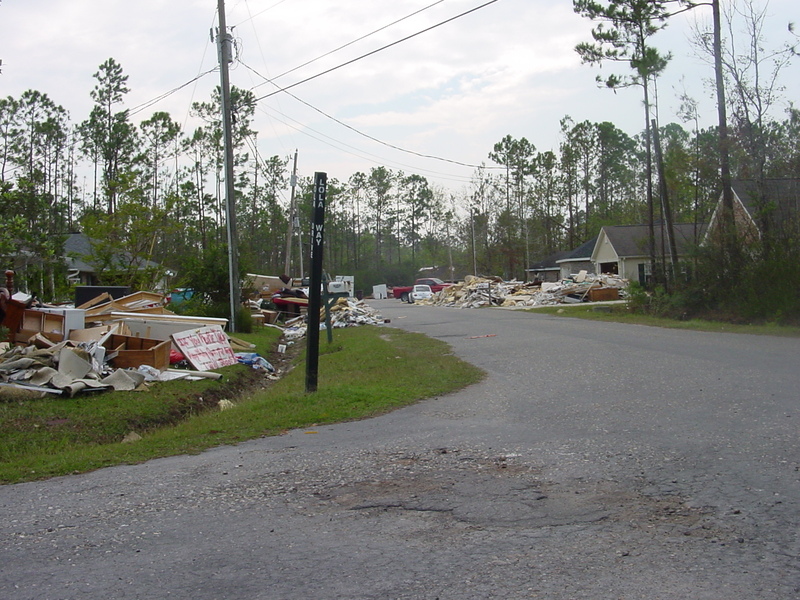 Katrina 13 – A common view for miles along the coast water front. Homes completely washed away, with the rubble washed inland and left behind. Driving south on highway 603, cars are tossed about in the ditch like toys. People who live in the low lying areas are known to park their cars along side the highway, on high ground, before storms come through. Normally, their cars are fairly safe. Katrina’s storm waters surged right over them. Driving through Waveland, we saw a boat in the drive through of Burger King, where the storm surge left it. I was surprised at some of the buildings/homes that are left in Bay St Louis. But they were all under water and I’m sure are no longer structurally sound. I thought about all the antique stores that were down in the “Historic Downtown” – the merchandise ruined in the storm surge. 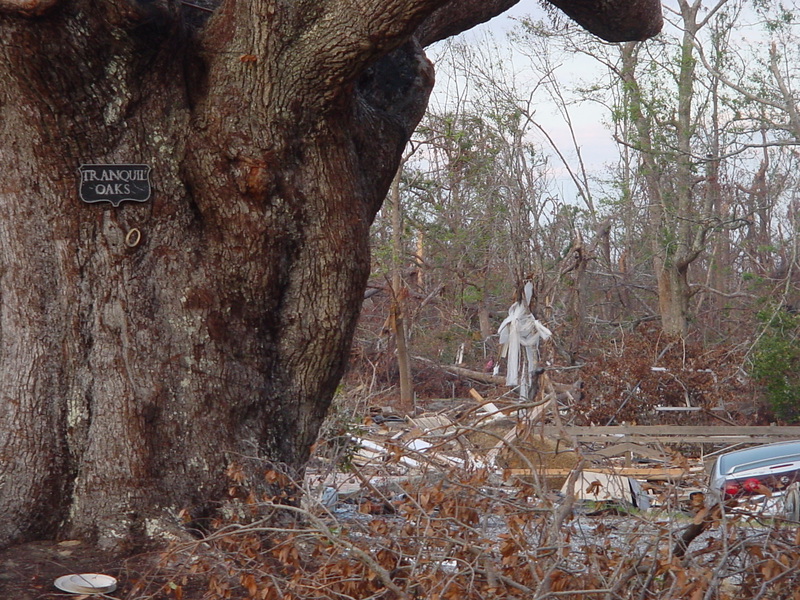 As we drove through the destroyed neighborhoods, the remaining trees had debris hanging from their limbs, up to thirty feet. How does one clean that up? I saw a little girl’s pink jacket hanging high on an oak branch. We tried to find the remains of the Bed and Breakfast that we stayed at last year on our anniversary. The owner was on CNN shortly after the storm. She and some others survived the storm clinging for life in one of the old oaks, after the house crumbled in the storm surge. We thought we found where it used to be located, but couldn’t tell for sure, with ten-foot high rubble piles. Life is still far from normal. Traffic is horrible where ever we go. Many businesses and restaurants are still not open (those that are repairable) and the ones that are open are short handed (many employees never returned to the coast), packed with customers and have limited hours. People have started to move out of the shock phase and into the angry, frustrated phase. This can be seen in people’s stupid driving and their rudeness in the stores. Everyone is tired, stressed and just wants to return to life as it was before a storm named Katrina blew into their lives.